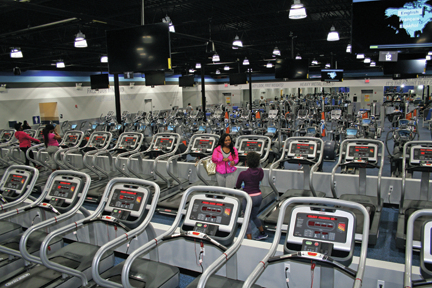 Treadmills, bikes, ellipticals and step machines fill the new Crunch Fitness location on South Broad Street. Crunch Fitness and Ollie’s Bargain Outlet share the 52,000 square-foot site formerly occupied by the SuperFresh supermarket in Independence Plaza on Broad Street. Inside Crunch Fitness’s 22,000 square-foot facility is a full-service gym with free weights, machines, over 85 pieces of cardio equipment, a turf field and a CTC unit which includes weights and a punching bag. Betz and business partner Evan Hoffer looked at different gym franchises before opening, and decided Crunch Fitness had the best combination of price point and what you can get for your money. Betz and Hoffer are a good team. Betz is a self-described “corporate banking guy with a financial accounting and banking business acumen.” Hoffer is a personal fitness trainer. The two of them met when Betz was working out at the club where Hoffer was working. Crunch Fitness offers different levels of service at different price points. For $9.95 a month, plus an enrollment fee, clients can come in and work out on the equipment. For $19.95 a month, plus an enrollment fee, they can also take classes. Workouts with a personal trainer are also available for an additional fee. Some of the classes offered, such as 360-3X, are unique to Crunch Fitness, as well as more well-known offerings such as Zumba. 360-3X is described as “360 degrees of pure work.” Using three 60-second sets grouped in rounds, 360-3X provides a total body workout. Currently about 45 classes are offered weekly as early as 6 a.m., and running throughout the morning, afternoon and evening. The full schedule is available at the Hamilton location page on Crunch Fitness’ website. Betz anticipates the schedule expanding and changing as Crunch Fitness grows. Membership ages vary from high schoolers to stay-at-home parents to minor league football players to office workers to senior citizens. Through various insurance companies, senior citizens aged 65 and above are eligible to participate in the Silver Sneakers fitness program. Through this program “members don’t pay anything, it is picked up by the Silver Springs program,” Betz said. They can participate in the BOOM series of three 30-minute group exercise classes. These classes include Mind (which combines yoga, Pilates and stretching), Muscle (a blend of cardio and strength-based athletic exercises), and Move It (a dance workout class that improves cardio endurance). Based on feedback from new clients, Crunch Fitness of Hamilton now offers childcare for an additional fee. They also offer hydro-massage and tanning. Crunch Fitness is located at 2465 S. Broad Street in Hamilton. Phone: (609) 888-2400. Web: crunchhamilton.com.